A woman grows up with certain things. Her one of the attractions is her hair. A man can’t imagine a woman without hair and for a woman; it is a horrifying dream to be a bald. She does lots of things with her hair according to different occasions. She clips it, she ties it, she keeps it open, she straightens it, and she makes it go curl and what not. But, like others, women also have hair loss problems. They lose hair everyday and that’s what haunts them while they see those broken hairs all round the hair brush. Why does this occur and what’s the solution to this, let’s find out. Why There Is Hair Loss? Hair loss, both in men and women, is caused by stress, some medical reaction or hormones. This causes telogen effluvium to thin the hair density in women. This can happen at any age. This is also related to the growth cycle of hair. The hair growth cycle can be defined in two parts; anagen, a growth phase which can last for three years and telogen, a resting phase which can last for three months. In telogen phase, the hairs are at follicle stage. During anagen phase, the new growth of hair pushes the telogen hair. But when a person is in extreme stress, more hair reaches the telogen phase resulting in more shed of hair and new hair would be thin. Women may also lose hair due to thyroid problems. What Are The Solutions To It? It is advisable to woman under 40 to regularly go for the checkup of hormones. 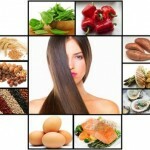 It is important that you know the reason behind hair loss, if any. As, hormones can be the reason behind hair loss, it is important that you keep it checked on a regular basis. You can also prevent it by taking proper care of your diet. You should have green tea more often as it’s good for your health and also for your hair growth. Take apple as it contains procyanidins which would help you to have a proper hair growth. Take food which are rich in protein and avoid pro-inflammatory foods. Also, if you are not suffering from high blood pressure then you can chew Organic licorice as it helps you to balance the hormone levels. Remember, hair loss can happen at any point and to anyone. It is important that you keep yourself healthy and fit by taking proper diet. The above mentioned are only a few solutions. You can consult your doctor for the mediation available in the market as they would have some side effects like itching scalp and once stopped using them could bring back the hair fall problem. So, keep visiting the doctor on a regular basis and ask him about the solutions for the hair fall.